When choosing an electronics manufacturer, you want to pick a company that has a good reputation and can handle the building of your product. To determine which electronics manufacturer will provide the best solutions for your needs, ask the following five questions. What Certifications Does the Manufacturer Possess?You want to ensure that the company has the certifications necessary to run their system. Ask for documentation as proof that the company meets the necessary requirements to create your product. This also goes for operator certifications. For instance, is their a certified IPC trainer on staff? What Equipment Is Used and What Is the Assembly Environment Like?A clean, easy to navigate factory is what you’re looking for. Although you may not be in the factory often (or at all) during the creation of your product, you want to make sure that the equipment is up-to-date and that the company is keeping up with new technologies as they emerge. Will They Be Completely Transparent with You?Transparency is key with any electronics manufacturer. You should be granted the opportunity to check in on your product whenever you feel like it. If the company doesn’t allow pop-ins or allow you to question any part of the manufacturing process, they’re not the right fit for you (or anybody else). What Is Their Inventory Management Process Like?Whether you are making a prototype or looking for an entire product run, you want to know that the company can handle anything and everything that could arise. Furthermore, you want to make sure they have the components and parts necessary to make your product on hand, to ensure that there are no delays in production. Do They Have References?Ask for a list of current and former clients that you can get in touch with. Talking to those who are currently working with the electronics manufacturer, or have in the past, will give you a sense of how they respond to problems, how efficient they are and what their customer service is like. You don’t have to call every single person who has ever set foot in the manufacturer’s factory; two or three references will suffice. If the electronics manufacturer won’t give references, they have something to hide. 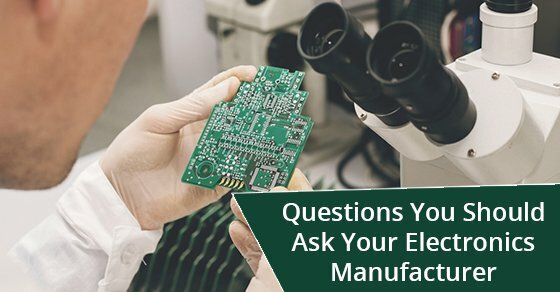 If you ask the above questions and get the answers you’re looking for, you’ll find the right electronics manufacturer for your product. Please contact us for more information regarding electronics manufacturing. We can help!